Apostolis and Litsa were watm and welcoming. Answered all out questions and did not hesitate to shuttle us to port and beaches outside of their normal shuttle schedule . Wonderful views from the room and awesome infinity pool. Overall a great stay- wish we had booked for longer. Outstanding views, amazing hosts, beautiful place. 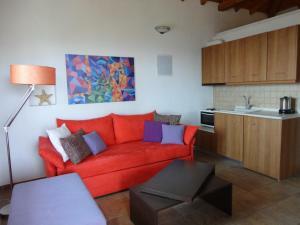 The cottages were very clean and comfortable, each with its own individual style. The owner could not have been more helpful, collecting us from the airport and dropping us off at the end of our trip. He also took us to the supermarket on the way, so we could pick up supplies for breakfast etc. There was also a terrace area and BBQ for each of the six cottages. As the hotel was up quite a steep hill, and a bit out of town, the owner also dropped us off in the evenings to go and eat, then collected us later on. The swimming pool was beautiful, set against great views of Skiathos town and the sea. 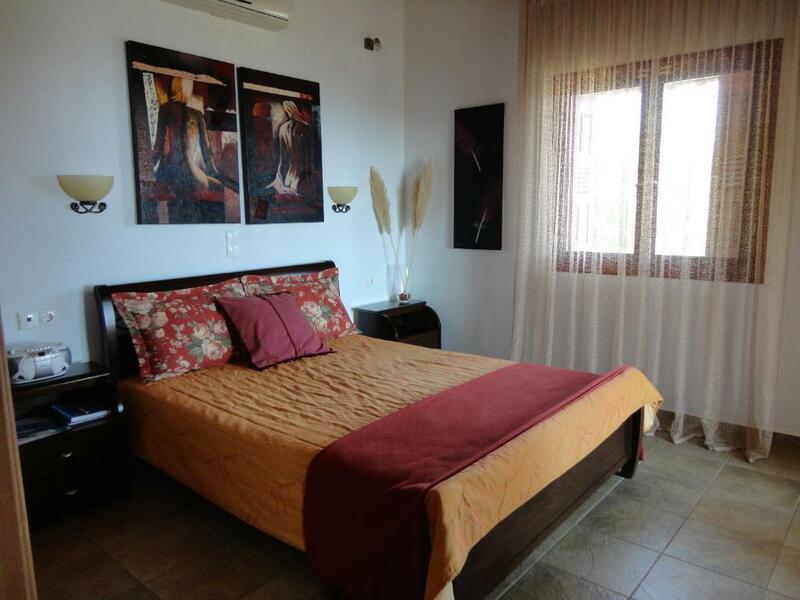 Apostolis and Litsa offer amazing well decorated cottages in a beautiful location. Views are stunning from the cottages and infinity pool and we all had a wonderful time. Free lifts offered to and from town. I didnt want to leave and will definitely be returning. 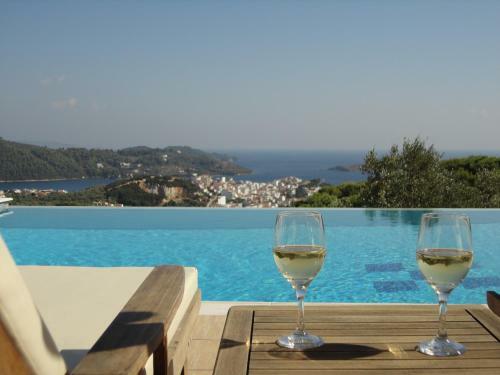 Excellent accommodation with fantastic views over Skiathos. Wonderful hosts who were very friendly and helpful. Airport collection available and several lifts per day to and from town. The room was exceptional, very clean. Air conditioning included within the overall price rather than an extra. Complimentary coffee and tea. The owner also provided a shuttle service to and from Skiathos Town several times a day. 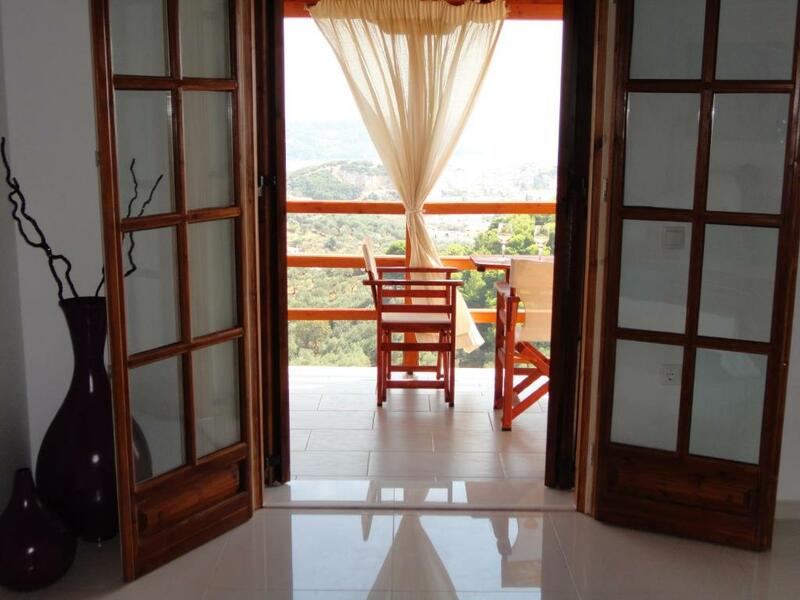 Stunning views, lovely cottage, super pool and great hospitality from Apostolis and Litza. The most beautiful views from the very gorgeous balcony and the owners of the properties - they simply could not do enough for us. This was a hidden gem, amazing views from the apartment, had everything you needed, big shower, air con, kitchen, large comfy beds, the owner offers lifts to and from Skiathos town which was just fantastic and he was just incredibly friendly also lifts to and from the Airport as well and a chance to get some shopping on our arrival. The infinity pool is just gorgeous and you can relax on the sunbeds around the pool with a drink from the honesty bar and just settle up at the end of your stay, it was so peaceful and quiet. We met some lovely other guests whilst we were staying, loved watched the planes taking off and landing from my balcony. Skiathos is a beautiful place with many beaches to visit and easy accessible by bus from the town, there are over 250 Restaurants to choose from and everyone is so friendly and polite. I simply cannot wait to return again to Skiathos Garden cottages it was a perfect holiday which I would highly recommend. Great swimming pool, views. Skiathos town is close thanks to regular shuttle given by the owner. Lock in a great price for Skiathos Garden Cottages – rated 9.5 by recent guests! Within 0.9 mi from the port, Skiathos Garden Cottages overlooks the lush countryside and main town of Skiathos and sea. 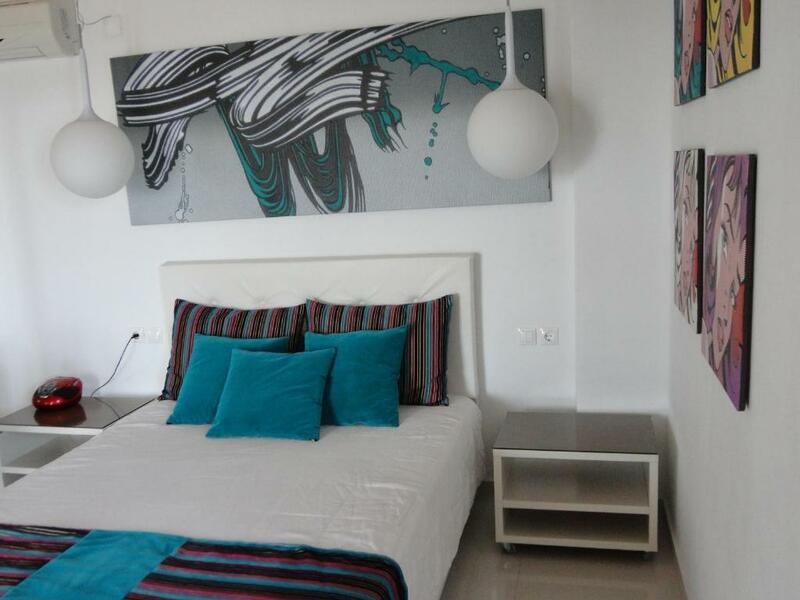 It has a swimming pool with hot tub and offers self-catering accommodations with living room areas and balconies furnished with BBQS. Skiathos Garden studios and apartments are decorated with bright colors and have a furnished balcony. They all feature a kitchenette with mini oven and fridge, as well as a living area. Other facilities include a satellite LCD TV, DVD and CD player. Guests can enjoy cafes and refreshing drinks at the poolside bar. Changing rooms and showers are also available on site. Children enjoy their own pool. The beach of Megali Ammos is 0.7 mi away and Skiathos Airport is at 2.2 mi. The complex’ staff offers free 2-way shuttle service to the port/airport, as well as daily transfers to Skiathos Town. Free on-site parking is available. When would you like to stay at Skiathos Garden Cottages? House Rules Skiathos Garden Cottages takes special requests – add in the next step! Skiathos Garden Cottages accepts these cards and reserves the right to temporarily hold an amount prior to arrival. The location, although not very far from town has hills to walk back from town. Lifts are offered by the owners but you are limited to those times unless you pay for a taxi. Not a problem for us though but could be for some. It was not an issue for us but the accommodation was up a fairly steep hill which may impact on anyone with mobility issues. Lack of cooking utensils. Inclines steeper than expected. We had a brilliant stay in Skiathos Garden Cottages. The cottages are set into a steep hillside, with the pool at the bottom. We stayed in two different cottages and found them both fitted out to a good standard, very clean and not too crowded with 4 of us in there (2 adults, 2 teens). Apostolis picked us up from the port and offered lifts to town and back twice a day which is really helpful. We had a car for a couple of days to explore the other side of the island, but for beach hopping a lift to town in the morning, followed by a water taxi saved a lot of hassle parking. The infinity pool is a lovely, relaxing way to end the day - and the walk back up the hill to the cottages helps to justify lots of ice cream! In the evening, we again took advantage of the lift into town and back for our evening meal. We moved cottage during our stay and Litsa made it very easy, moving everything for us - even food in the fridge! Apostolis and Litsa were both incredibly friendly and we would thoroughly recommend this accommodation. Amazing views from the infinity pool and stunning views from the terrace of the cottage. Lovely, friendly owners who provide free lifts to and from town.